Much to my annoyance this week has been very bitty as due to work commitments I couldn't travel very far from the house. Nevertheless I still managed to get some birding in and was very happy with the results. 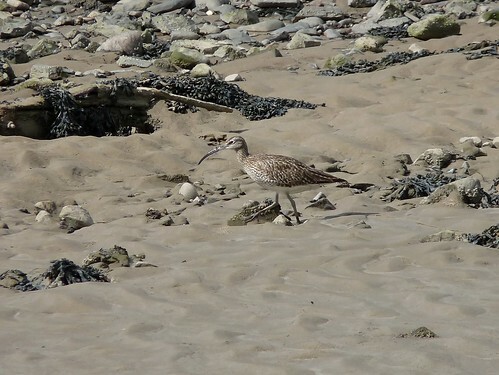 I visited the recently discovered path along the River Loughor on a couple of occasions in an attempt to relocate and photograph the Whimbrel that I had spotted there on my first visit. Initially things didn't look good given the number of dogs that were out and about, but I was not to be disappointed as a couple landed on the shore very close-by. The sun even came out allowing me to get a couple of pics before they realised I was there and took flight again. 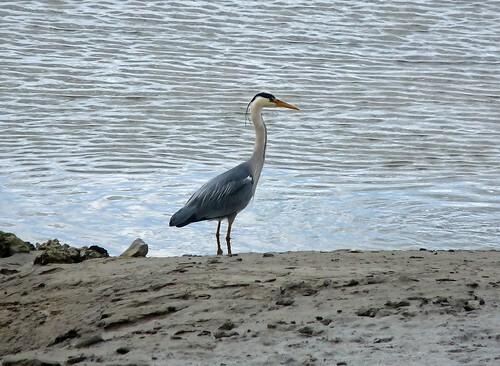 The mudflats also held a couple of Grey Herons and Little Egrets again, of which the Egrets were being particularly territorial towards each other. 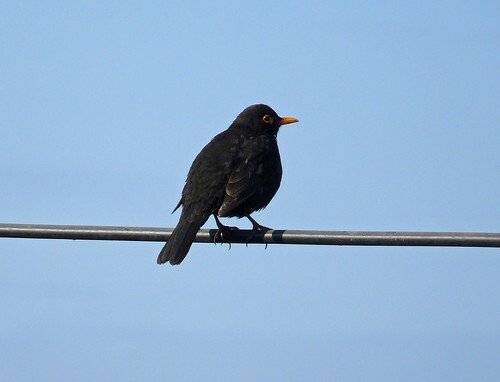 Back at home one of my resident Blackbirds was enjoying the sun on the telegraph wires. Sunday afternoon was spent exploring the valley at the back of the house and once more I was amazed at the number of species that I can see so close to home. 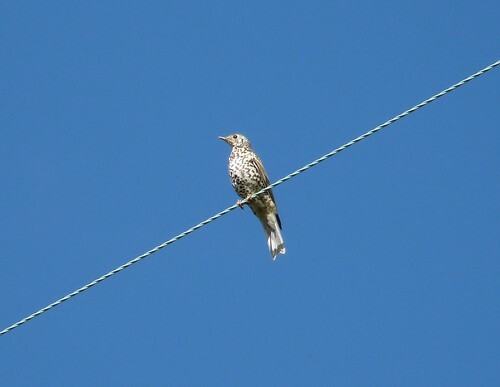 First on the list was a family of five Mistle Thrushes who were loudly calling as they moved through the treetops. One landed on the overhead power cables allowing a photo opportunity. I was surprised how pale this particular individual was which when combined with the bright sun made it appear almost white. 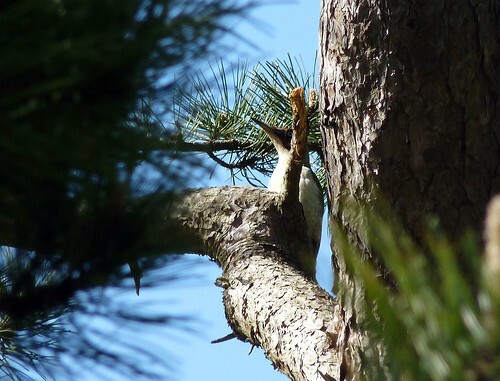 The pair of Green Woodpeckers that I originally found three or four weeks ago are still present and being as noisy as ever. 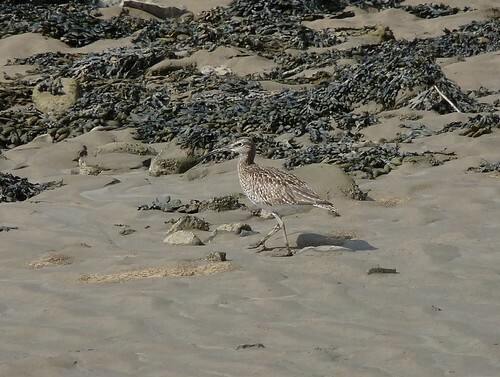 I tried my best to sneak up on one of them but it was having none of it. He superbly hid just out of sight before deciding that he had toyed with me enough and flying up to an out of reach tree. 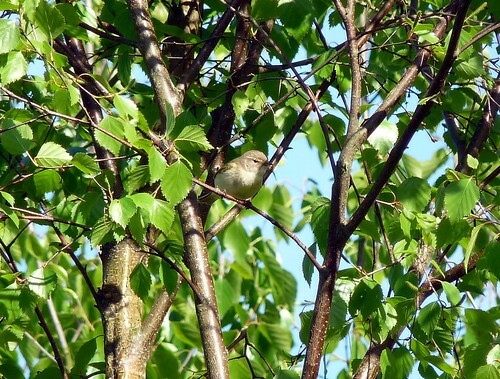 The warblers were out in force with numerous Chiffchaff and Willow Warbler calling from every direction. My partner also found a male Blackcap but I missed it as I was further down into the valley. 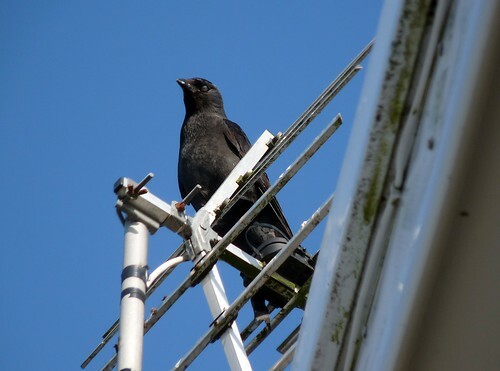 I'll also throw in a picture of one of my garden Jackdaws that continue to ravage the feeders every day. As we ascended back out of the valley we were treated to a female Sparrowhawk gliding past at eye level, whilst three Rooks were also flying nearby. Rooks are relatively scarce around the house so this was a good sighting. Shortly after I was stopped in my tracks by a Slow Worm sunbathing in the middle of the path. I can tell you that they are anything but slow as it was gone long before I managed to turn the camera on. All in all a very nice walk that was finished off brilliantly by a couple of soaring Buzzards and a Red Kite that flew just over the rooftops. Magic.